Bureaucracy or stalemate by design? Policy, procedure, and bureaucracy tend to creep as an organization grows in size: revenues, market share, employees. With that creep does organization culture benefit with bureaucracy? Bureaucracy may, indeed, provide organizations a strong case to manage risk. While a small organization may have flexibility and ad hoc procedures based on one-on-one interactions, as an organization adds people the original interactions of smaller teams are stretched beyond first-level interaction. This means the track record of things that may have been consistent is now flexed beyond first-level accountability. You expect an organization grows to meet the demand of added revenue. However, if your original processes and procedures were flexible and not well-documented, you now run a risk to quality when you grow to fast. If the wheel wobbles at 5mph then at 65mph the wheel is teeth rattling. The Internet, as a tool, is a good example of the speed element in process: just because I can do something faster, does not mean I can or should accelerate my output. If I do not flex to meet acceleration, then acceleration, itself, becomes the stress that cracks quality. In growing organizations the “way things are done around here”, also known as culture, turns into a secret sauce left to those originally initiated. With growth new jobs are added. I’ve seen process and procedure looked at as a burden in organizations that are really only trying to manage and mitigate risk. The alternative to developing a bit of bureaucracy is a shoddy strategy soon left for those who don’t figure the culture out to just flame out. The people who can not understand the culture needed are too easily relegated to the dustbin comment of “well they just did not fit in the culture”. Soon the culture war defeats needed growth. The risk is myopia, glad handing, and a kleptocracy. To combat risk organizations feel [or actually do] need more process and procedure. 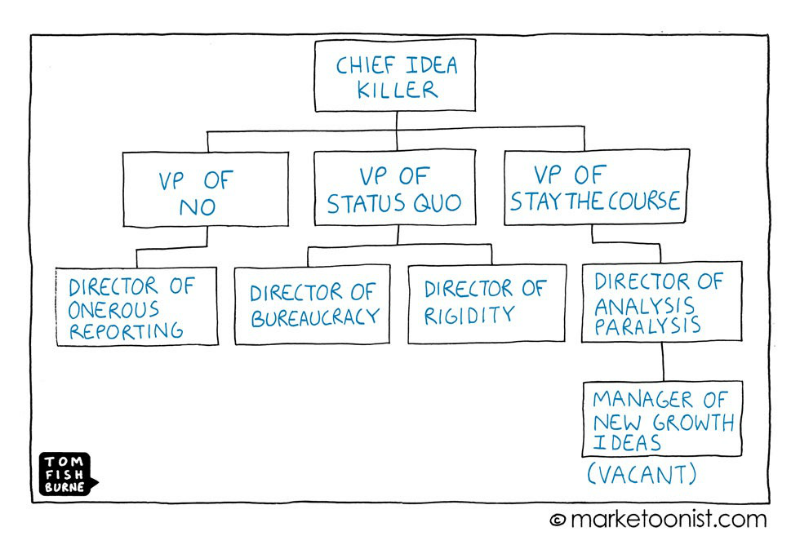 Soon hierarchy is required to sign off or review of things and double/triple check people, decisions, or products. All in the effort to manage and mitigate risk and manage from a smaller shop to a larger, dispersed organization. Some organizations seem to set policy and procedure intentionally to make up for active, engaged management or for management by walking around or an organization where management knows each and every employee, their role, their responsibility, their capability, and their limits. You should not count on culture to snap someone into shape. Culture is not a management process, culture is a lever for action, not a tool for punishment. To counter culture [pun intended] policy arises. Reporting structures become formalized. Names begin to be replaced by job titles or job codes. So, in absence of effective management, culture and policy becomes the panacea for active, engaged management. Business process re-engineering was the intended intervention to poor process. As a radical review, business process re-engineering reviews end-to-end process, not pieces or departments within who are part of the process. If you can not review the process from the input through the final output, you only adding bureaucracy and process. Organizations should grow and cultivate culture for resiliency, flexibility, rigidity, and flow. Selective pruning of employees who no longer fit the future-state culture needs of policy and procedure is necessary and on-going strategy to stay healthy. Identify what culture creates and realize competing values can drive your organization out of business. Here’s a good view to measure your bureaucracy: if you have sign-off authority for something and you can’t-for-the-life-of-you remember the last time you actually reversed a decision to what you were signing and refused to sign-off, then you are within an overly-bureaucratic process.